Also Recommended: The live-action Hamtaro singalong, as performed by Mini Moni. Notes: This review is based on the original Japanese version, which was originally released theatrically at a children's festival. 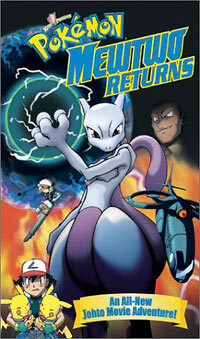 However, in the US release, it is shown as a movie trailer prior to the first Pokemon movie. All the human characters of the show release their Pokemon for a day to play at a Pokemon-only amusement park. That's it. One day in Teletubbie, I mean, Pokemon Land, Pikachu decided to go play. Togepi began to cry. Squirtle gave Togepi an apple. Psyduck stole it. Togepi cried again. Pikachu made a funny face. Bulbasaur sang. Dane! Daa-ne! Pikachu gets bullied by a gang of other Pokemon. Pikapika! The Pokemon have a contest. And somewhere along the way, Charizard gets his head stuck in a hole. Everybody works together to free him. They all watch the sunset. The End. Pika-piiiiii! I swear to God, this is the entire script to Pikachu's Summer Vacation. Even for a closet Pokemaniac like myself, this was just too much. (Pika! *twitch twitch*) There are, for all practical purposes, no humans in this movie. All you see are Ash and Misty's Nikes. The only understandable dialogue in this is the patronizing narrator, who serves only to state the obvious in infantile phrasing, and enhance the feeling that you are watching Teletubbies instead of Pokemon. I kept expecting Tinky-Winky to pop out any moment and yell, "Again! Again!" -- to which then, I would've promptly slapped it. If they had at least subtitled the Poke-speech, it may have been almost tolerable ... and it IS cute. Too cute. And scene-changes are highlighted by brief scenes of dancing Pokemon that are as disturbing as they are adorable. And the theme music was just too perfect, hyper-cute, and sticks with you like Krazyglue to the brain. You find yourself humming along and snapping your fingers while those oh-so-kawaii Pokemon bop-bop-bop along on their way to the park, long after the video's been returned to the store ... a week ago. Parents, take advantage of this time to get popcorn and snacks for your kids. Recommended Audience: For little children only. In fact, relentlessly for little children only. This is strictly for the Teletubby set. The only reason I survived it is because I have a nieces. I'm used to it now.